Immanuel has been making disciples, baptizing and teaching all that our Lord has commanded us for 169 years! This ever changing culture and world continue to challenge us to make sure we’re doing the best we can as a church to assist parents in raising their children in the faith in our Lord Jesus Christ. We will continue to assist and depend upon the involvement and loving example of you parents as you are the biggest influence on your children and their faith. Our church practices infant baptism, as Scripture speaks of baptism as entirely God's work—it is not dependent on our belief, on our acceptance of Jesus or God's truth, or on our choosing to follow Christ. Although many are baptized as infants, we also baptize older children as well as adults. 5th and 6th grade: Luther's Small Catechism is studied. First Communion is celebrated on Palm Sunday of 6th grade year. 7th through 12th grades: Bible study continues to build on Catechism lessons (from Faith Foundations). 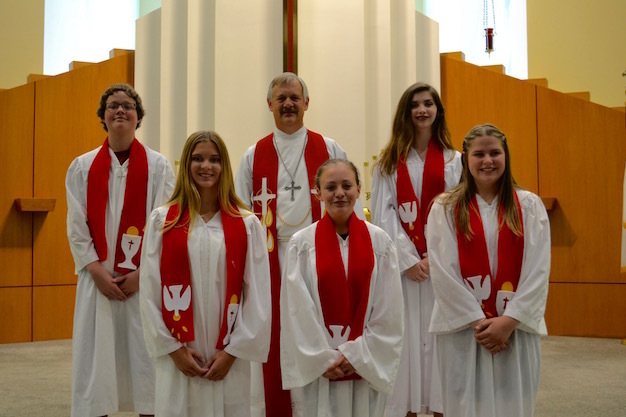 Students confirm their faith at the conclusion of their 8th grade year (Confirmation in May) and continue their discipleship development through Bible study during high school years. Immanuel Lutheran Preschool is a vital ministry of our church -- please see the Preschool section of our website for more information. Immanuel Lutheran God's Kids Club meets on Sunday mornings from 10:15 am through 11:15 am for preschool 3 year olds through sixth grade (September through May). Please see the God's Kids Club page for more information and highlights. Immanuel Lutheran VBS is usually held in June and classes are available for three year old preschool through sixth grade. Please see the Vacation Bible School page for more information and pictures from previous years. As parents, you want to give your children a good start in life. The best start that you can give them is to bring them to the Lord Jesus Christ in Baptism. In and through Baptism, a child receives all the blessings and merits of Jesus' atonement for our sin. 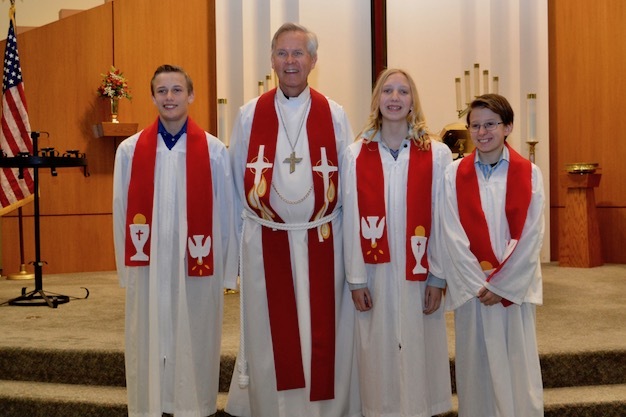 Through Baptism a child is adopted into the family of God, the holy Christian Church. Baptism is only the beginning of the faith journey for a child. The Bible admonishes parents: "Bring them up in the nurture and admonition of the Lord." (Ephesians 6:4) It is the further responsiblity of the parents to follow baptism with Christian training. 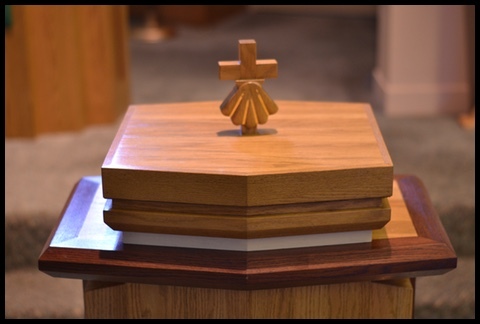 Immanuel Lutheran is glad to assist parents as they lead their children to worship, teach them to pray, and lead them to seek the Lord's Supper. At Immanuel, membership is not required before bringing a child to baptism. The parents will receive counsel from the Pastor regarding baptism and the ongoing Christian training of the child. We look forward to walking alongside parents as they guide their children. For students beginning fifth and sixth grade, we have Faith Foundations: opportunities to learn the basics of the Christian faith from Martin Luther’s Small Catechism. Of the 6 chief parts of the catechism, students will study the first 3 parts in fifth grade and then the second 3 parts in sixth grade. In January/February of their sixth grade year, students will undertake a study of the Lord’s Supper that will culminate in their First Communion beginning on Palm Sunday. Faith Foundations meets each week on Sundays from 10:15 am to 11:15 am during the school year (Sunday after Labor Day to May). Students who are beginning seventh and eighth grade become part of our youth group and ongoing discipleship as they gather on Sundays from 10:15 am to 11:15 am beginning in September after Labor Day. Through Bible study and time together, they will continue to build on what they have learned. Their studies continue as they learn how to live and use their faith while facing the challenges of junior and senior high school. We will continue to equip them in discipleship through the study of the various essential aspects of Christian life and discipleship: faith, worship, study of God’s Word, witnessing, fellowship, stewardship, and service. 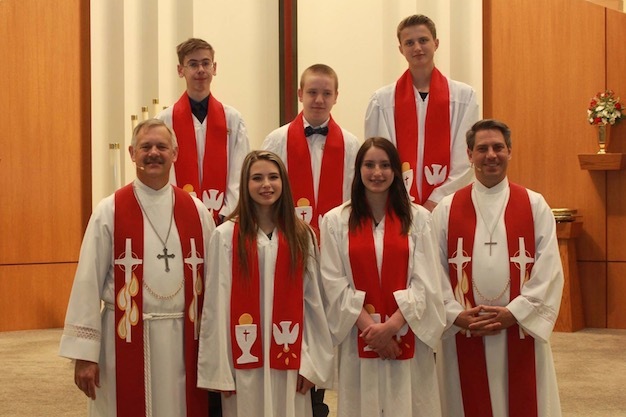 As usual, Confirmation will take place at the conclusion of the eighth grade year, when students will publicly confirm their faith on the third Sunday of May at 9:00 am.